Culms: Stiffly erect, simple or sparingly branched, glabrous. Blades: Flat or involute near the tip, 4 to 8 inches long, less than .08 inch wide; upper surface occasionally with a few hairs near the base. Sheaths: Keeled, flattened, glabrous to sparsely hairy. 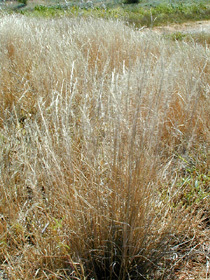 Inflorescences: Panicle, narrow, slender, 4 to 12 inches long, purplish-gray or brownish; branches less than one inch long, crowded in upper portion of inflorescence. Spikelets: Narrow, crowded, one-flowered; first glume slightly longer than the second; lemma often covered with purplish spots; awns three, .6 to 1 inch long; central awn slightly longer than lateral two. Distribution: Principally in the east half of Kansas. Comments: Arrowfeather threeawn is an invader that will increase in overgrazed pastures. Compare with purple threeawn and prairie threeawn.